BUY THE BOOKS IN PAPERBACK OR KINDLE. Welcome to my series of books telling the tale of a lady trucker following her dream to drive the roads of Europe and own her own haulage company. Mothertrucker – Starting Out: Carol Landers, starts her career as a trucker, driving over the mountains into Italy with only her glamorous friend Gina for company. After a trip fraught with danger Carol meets Tony in the Tuscany hills. A life changing meeting for all of them. Mothertrucker - Driving On: Tells of the dangers faced by drivers when trucking abroad as Carol and Gina race across Europe in a desperate attempt to rescue Gina’s husband from the horrors of a Bulgarian prison. Mothertrucker – Journey’s End: The final book in the series finds Carol Landers looking forward to a bright future, totally unaware that a danger far worse than she could imagine is shadowing not only her own life but the lives of those she loves. Authors note. I wrote the first Mothertrucker book 'Mothertrucker - Starting Out' just for fun to give to family and friends but much to my surprise the book proved to be popular not only amongst truckers but teenagers and housewives alike. The story of a determined woman forging ahead in what was traditionally a man’s world caught the imagination of many, and I received many letter and emails asking ‘What happens next?’ to our lady driver - so 'Mothertrucker – Driving On' followed onto the bookshelves. Once again my loyal readers wanted to hear more, so I found myself once again writing about the lives of Carol and Gina, although 'Mothertrucker – Journeys End' really is is the very final book – well at least for now! After some time without putting pen to paper so to speak I decided to make some notes - once again just for fun - about my post war childhood years growing up amongst the bomb sites of Manchester and having dreams of better things - with a mother that really did warrant a book being written about her!! From her bright idea of a place in the country - which turned out to be a converted bus - to blowing up the garden shed - Mother was a one off! 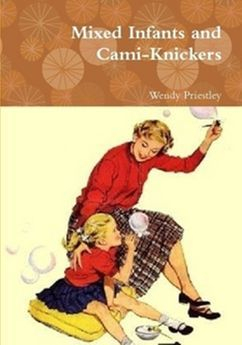 Mixed Infants and Camiknickers has also proved to be a very popular read with some lovely feedback from my readers - many who can identify with the era and the happenings of yesteryear .